Coke and other carbonated drinks contain the gas carbon dioxide. When you drink Coke, you swallow both liquid and gas bubbles. A lot of the time you release this gas with a quick belch. Though not a very polite thing to do, belching lets gas escape from your body. However, in some cases drinking a lot of Coke can cause bloated or gassy feelings in the stomach and digestive tract. Coke contains sugar, water and carbon dioxide infused into the liquid. Opening a can of coke allows the compressed carbon dioxide to form bubbles and escape into the air. The bubbly, fizzy feeling of Coke in your mouth partly comes from the bubbles of CO2. Lots of the gas escapes from your mouth or resurfaces from your throat as a belch. However, drinking lots of Coke at one time forces large amounts of the liquid into your stomach where the gas may pass to your intestines. Gas in the intestines is perfectly normal. Microbes involved in digesting foods in the gut produce gas byproducts. You'll also swallow some air throughout the day. Most people don't notice these small amounts of gas in the gut. However, along with all of these general forms of intestinal gas, Coke may add more gas to your system. At some point, this extra gas may make you feel bloated and tight in the stomach area. Lots of sugar in foods or drink can trigger more gas production in your intestines from bacterial fermentation. Coke contains a lot of sugar. A single 12 oz. can of cola contains around 33 grams of sugar, according to the USDA National Nutrient Database. This large amount of sugar could lead to bloating and uncomfortable feelings in the abdomen. Sugar-free colas may help prevent the added gas caused by fermentation, though you'll still have to deal with the gas from carbon dioxide. Drinking Coke while also eating gas-causing foods such as broccoli, beans or cabbage may increase bloating. 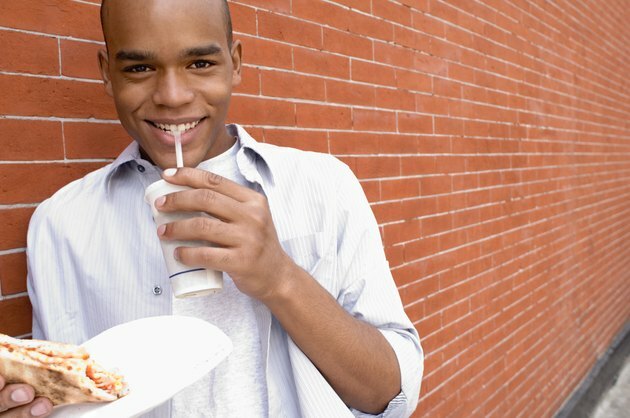 Try avoiding these foods when drinking carbonated drinks. Similarly, drinking less Coke and at a slower rate reduces the amount of gas passing into your body. If you regularly feel bloated, even with small amounts of Coke, then it may be a sign of another digestive disorder, such as irritable bowel syndrome. If you experience excessive or painful abdominal bloating, speak with a doctor.